The MCP1253-33X50 and MCP1253-ADJ are inductorless, positive regulating, low noise charge pump DC-to-DC converters. 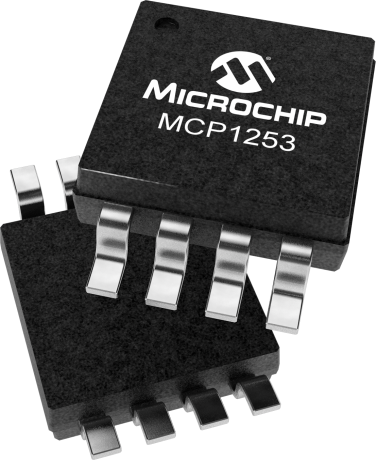 The MCP1253-33X50 has selectable outputs of either 3.3 or 5.0 V, while the MCP1253-ADJ has an adjustable output between 1.5 and 5.5 V. Both can deliver 120 mA of load current at the selected regulated output voltage. Since the device incorporates an automatic buck/boost feature, it will maintain the regulated output voltage whether the input voltage is above or below the output voltage. These charge pumps operateat a switching frequency of 1 MHz (reducing capacitor sizes), and feature power saving shutdown pins, short circuit protection, thermal shutdown, and power-good pins that report out-of-regulation conditions.